With 4th test at Nagpur ending in a draw due to determined efforts by English batting pair of Trott (143) and Bell (116*) on a fifth day; India lost test series to Barmy Army 2-1. Alastair Cook’s men created history by beating India on their home soil ending long wait of 28 years. Fast bowler James Anderson was judged as Man of the Match for his sensational bowling performance of 81-4 during Indian batting. While Cook bagged Man of Series award for remarkable batting couple with inspiring leadership. 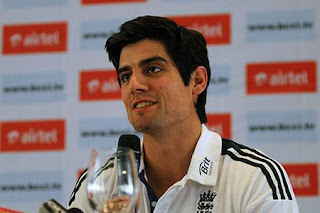 Cook scored 562 runs at an average of 80.28 scoring 3 centuries. England played as an outstanding cohesive unit during the entire span of test series overcoming unfamiliar conditions coupled with huge pressure from Indian crowd. Especially, batting of flamboyant Kevin Pietersen, gritty innings by wicketkeeper Matt Prior along with impressive bowling by spin duo of Swann and Panesar were key highlights for visitors.